Rensselaer City Hall is located at 124 South Van Rensselaer Street, Rensselaer, IN 47978; phone: 219-866-7602. Photo: Oren F. and Adelia Parker House, ca. 1920, 102 Park Avenue South, Rensselaer, IN. 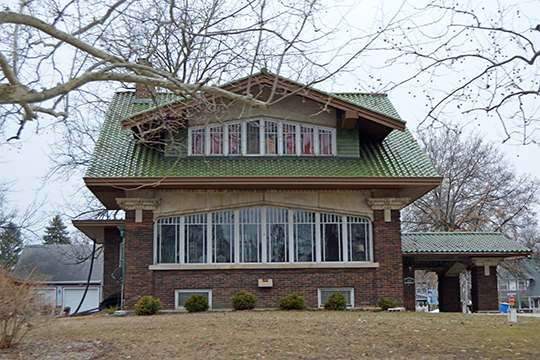 Listed on the National Register of Historic Places in 2014. Photographed by User:Nyttend (own work), 2015, [cc0-by-1.0 (creativecommons.org/publicdomain/zero/1.0/deed.en], via Wikimedia Commons, accessed March, 2016. Rensselaer, seat of Jasper County, is a residential town and trading center for a prosperous farming area. At the entrance to Memorial Park, on the opposite side of the Iroquois River from the business district, is a bronze statue of General Rober Houston Milroy, a veteran of the Mexican and Civil Wars. When Fort Sumter was fired on, Milroy recruited a company of Indiana volunteers and was made its captain. At Winchester, Virginia, men under Milroy's command held back Robert E. Lee's troops for 3 days when the Confederate general began operations to invade Pennsylvania. After the War, Milroy became a trustee of the Wabash and Erie Canal and later, superintendent of Indian affairs at Olympia, Washington. In the Presbyterian churchyard at Cullen and Cornelia Streets, is the grave of James Van Rensselaer, a Utica, New York merchant who founded the town in 1837 and operated a community grist mill.